Lab Armor™ Beads are dry, thermal metal alloy beads designed to replace water in existing water baths, aluminum blocks in dry baths, and ice in ice buckets. Beads can also be used in containers placed in ovens and incubators to replace sample racks for better control of sample temperature. – Far less conducive to microbial contamination than a water-filled or ice-filled bath. – No one enjoys water bath cleaning duty. A bead-filled bath requires minimal cleaning and doesn’t need to be regularly monitored, emptied or refilled. – The recyclable beads eliminate the routine use of harmful germicides and make a water bath over 50% more energy efficient. – A bead-filled bath naturally holds common lab vessels in place without accessories such as racks, floats and bottleneck weights. – A bead-filled bath is always on, ready for the next experiment, so lab professionals don’t have to plan around warm-up times. There is also no burn-out risk because there is no water to evaporate. – Sample vessels are not limited to water-tight containers anymore. 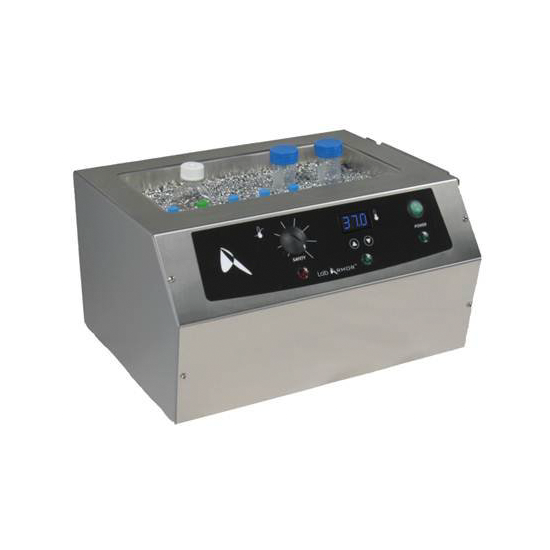 So lab professionals can safely incubate Petri dishes, multi-well plates, and open-top tubes at any angle – there no water to wick under the lids. – Sample vessels can be conveniently buried into the beads to avoid temperature gradients associated with exposure to room temperature air. – Flexible working temperature range from -80 ºC to over 300 ºC. – 6L, 14L and 20L.